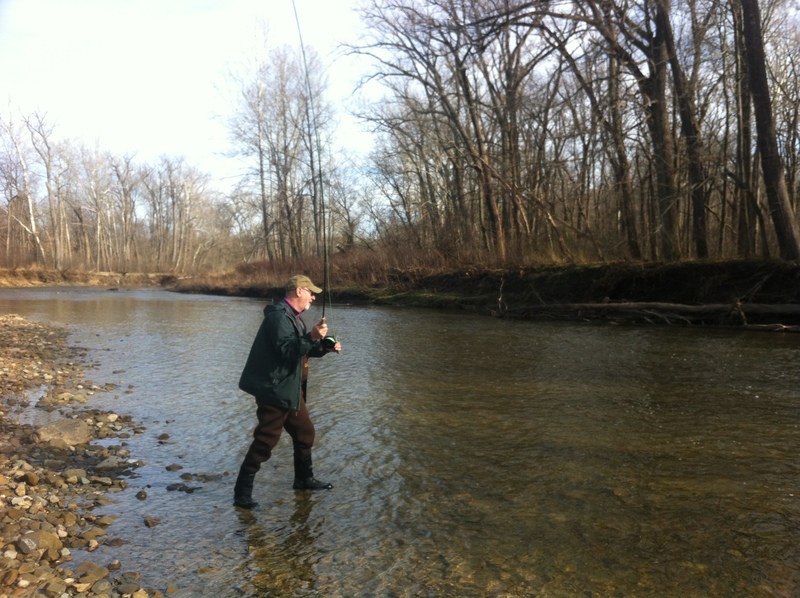 This past Sunday Craig Yingley and I headed up to the Chagrin River towards Willoughby, Ohio to try a bit of fly fishing for Steelhead. 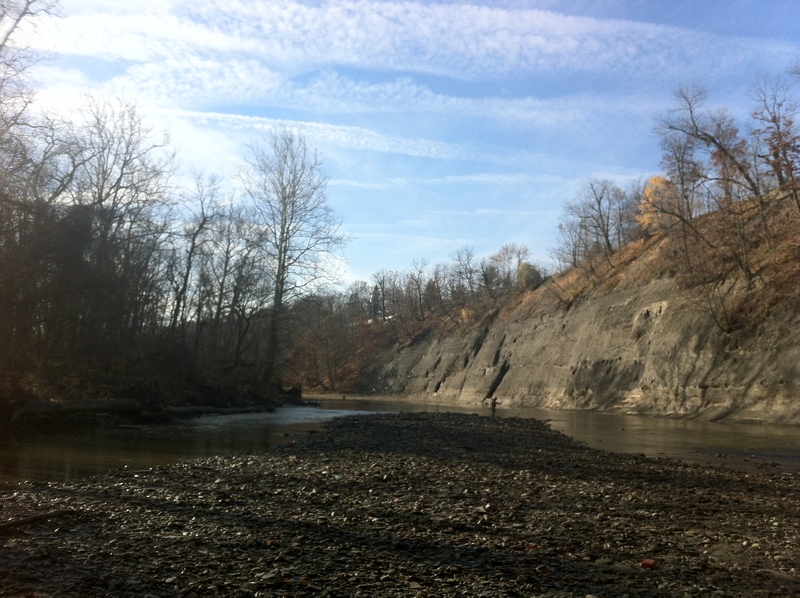 The day was beautiful with bright sunny skies and the temperature in the upper 40′s. I took Craig to a spot he had never fished before, one that was shown to me by a guide last year. When we arrived we did a quick ‘once over’ and saw that there were about six fishermen, with only one fly casting. We asked if anyone had landed anything and one fellow pointed to a guy across the river saying he’d seen him land about a 2 footer using a minnow as bait. We then suited up and started wading down stream. The spot where we were headed was around a bend and out of sight of the fishermen we had just left. This first image shows the area once we had turned the bend and on a gravel bar. The water was low, but still seemed to have enough depth to hold some fish, and had a bit of color from the leaves, with the big question being, was there enough color to allow us to not be seen by any steelhead. Just past this sand bar is the run where we were headed. The run is about 50-75 yards long and looked great, but as we all know, looks doesn’t mean you’ll catch fish. As the saying goes, ‘If you ain’t losing flies you ain’t fishing close enough to the bottom.” Craig and I figured we were doing everything right since we were losing flies on every other cast. After a few hours at this spot we decided to head to a place that Craig knew of. The spot was further up stream by about 15-20 minutes driving time. I had never been to this area before, and when we hit the water I told Craig that it looked great, not a sign of any buildings around, and hardly any people. The only folks we saw were a group further way up stream that seemed to be spin casting. 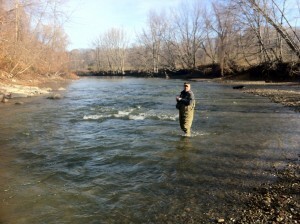 As we waded in a fellow fly fisherman joined us. He told us he was just starting out, and then said that the river had really changed since he had last fished this area, which was prior to hurricane Sandy. He pointed to one huge tree that was over over on the far side of the river and said it had washed about 100 yards down stream from where he last remembered it was located. We started casting at a spot Craig said had previously held fish, again, no luck. Craig then made a great comment, “The thing about steelhead, they’re not like trout, which will spend their whole life in one area. 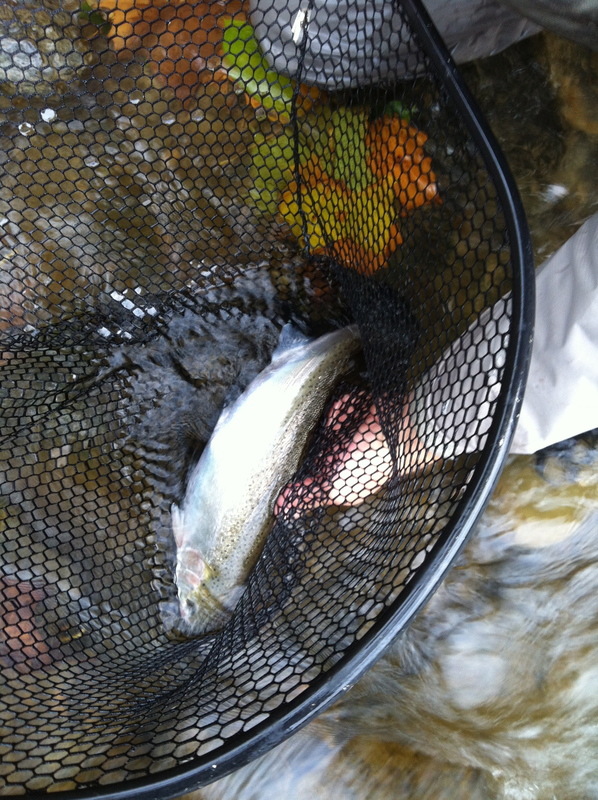 Steelhead are on the river for one thing, to head up stream and spawn. Where you find them one day doesn’t mean they’ll be there next time.” Oh so true. So after a day of not even one strike, we of course blamed it on the low water, it was too clear, they just weren’t eating, and hell – for all we knew there was just to much glare off my bald head! 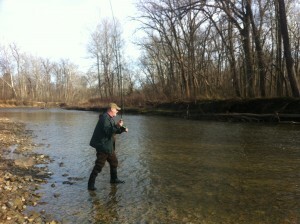 I did get Craig to take a picture of me casting. So here’s one of me hamming it up for prosperity. With a holiday coming up, and if we get any rain, maybe I’ll try again this weekend.